Today, political violence has become the scourge of our world and terrorism is routinely described as a uniquely modern evil. Yet however unprecedented in scope the new terrorist organizations might appear, Matthew Carr argues in this definitive history of terrorism that they are merely offshoots of a spectacular bombing in 1881: the assassination of Tsar Nicholas II by terrorists . . . or were they freedom fighters? 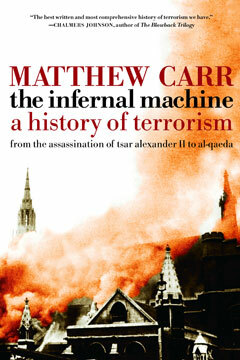 Thus begins a narrative of extraordinary sweep that Publishers Weekly called “engrossing, unsettling” and the Boston Globe praised as “brave and wise” and “a book for the ages.” In The Infernal Machine, Carr unearths the complex realities of terrorist violence and its indelible impact on nations as different as Italy, Argentina, France, Algeria, Ireland, Russia, Japan, and the United States. Spanning over a century of world history, The Infernal Machine reveals stunning similarities in societies’ responses to terrorism despite profound political and cultural differences. Carr demonstrates again and again that the true impact of terrorism has been felt in the overreactions of government and the media to acts of political violence. This “encyclopedic and diagnostic . . . primer for our frightening times” (Edmonton Journal) allows us to see our current predicament against a background of striking historical parallels.